The International Organisation for Relief, Welfare and Development, one of Saudi Arabia’s major humanitarian agencies this week unveiled food aid worth US$100,000 (Approx. 370m) meant to support the government of Uganda’s efforts to feed refugees in Kyaka refugee camp in Western Uganda. The move was hailed as a monumental step by an Arab country towards Uganda’s effort to host refugees now numbering about 1.2 million across the country. Although Saudi Arabia has for many years been a top donor to the World Food Organisation (WFP), few Arab countries have in recent years made direct donations to Uganda’s efforts to host refugees. 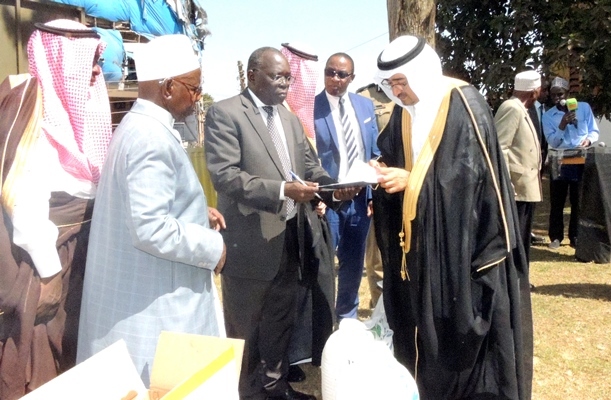 Menya’s remarks came after the Ambassador of Saudi Arabia Dr. Abdallah Fahad AL-Khatani noted that the World Muslim League –the hosts of the International Organisation for Relief Welfare and Development in Uganda, will make similar donations of food to at least 11 refugee camps in Uganda. Commissioner Menya appealed to the Saudi government to look beyond food aid for refugees by also considering supporting the government of Uganda in its efforts to provide education, healthcare for refugees and the refugee hosting communities. The boss of the International Organisation for Relief, welfare and development Uthman Hamad Omari noted however that as part of the support to Uganda, his organisation will provide relief food to poor families in Busoga, not necessarily refugees.